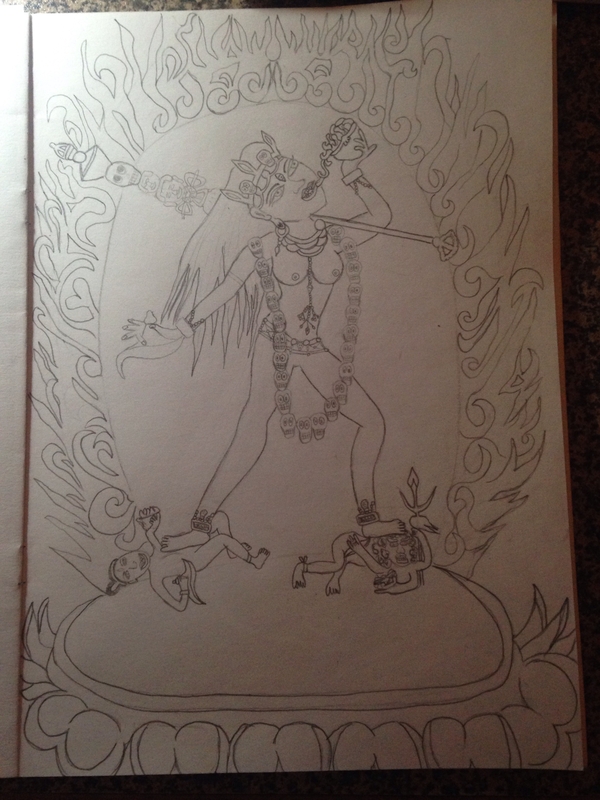 Here's my drawing of Vajrayogini - I wanted to share it before I started coloring her, I'm worried to wreck her. I copied ideas off several different pictures online and also took what Tsem Rinpoche says about her and tried to incorporate some of that into it. Why are you worried about wrecking her? I have devoted practice to her darkininess ... I Love wrathful deities. Delicious with the right dip, a side salad and a finger snap ability to dismiss. I'm really pleased with how she turned out - I was worried about adding colour because I didn't want to mess her up & wreck her. Now I'm thinking more along the lines of as long as the same effort and love is put into the colouring as was put into the drawing then I'll be happy with it cause the intention is good. @lobster - thanks for sharing that thread, it was looking at the art on it that inspired me to start this.